Warning: This post contains a few graphic pictures, but you should still take a look…just warnin’ ya! The family farm, thus far, has only three types of animals, certainly not a large farm. Not even as large as our chicken farm in Alaska, with, at one time, 43 chickens. First, there is a cat. 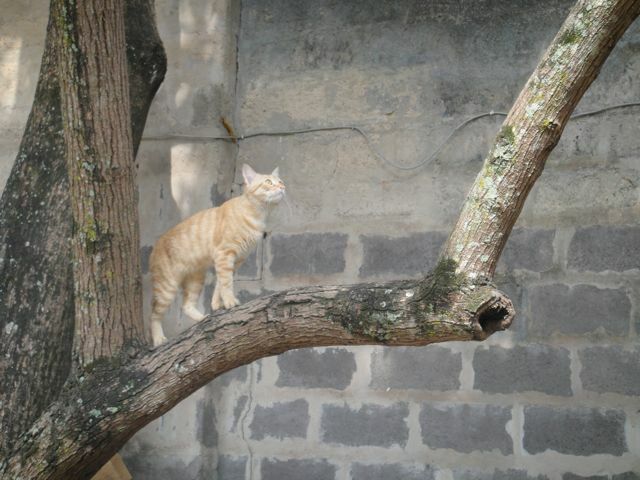 Sunshine is a Congolese version of an orange tabby. He is very sweet, patient with the kiddos, and came with the house. He was treated like royalty, as far as we can tell. He was well-loved and it has been an adjustment (for him far more than for us) to not have quite the standing in the house he is used to. He’s has done a commendable job of adjusting, though. And he’s Levi’s best friend, despite the well-deserved scratches on Levi’s arms. In June we acquired some bunnies. To eat. Bunnies, as I call them, rabbit, which is the preferred term for bunnies meant for eating, or les lapin, French for bunnies. (If I ever spell my French incorrectly, it is because I didn’t look it up first. Thus, you know I knew it from learning it in action, versus looking it up to look cool.) We bought two pair. We meant to buy a male and three females, but that’s how it goes. 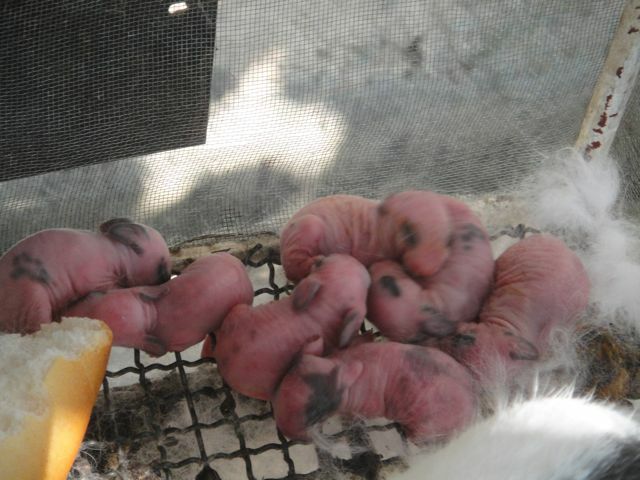 Anyway, we quickly had our first batch of baby bunnies in early July. The mother wasn’t very good and it was fairly cold (you know, for Congo), so out of the seven that were born, only three survived. However, those three did a great job and are now nearing full grown status. 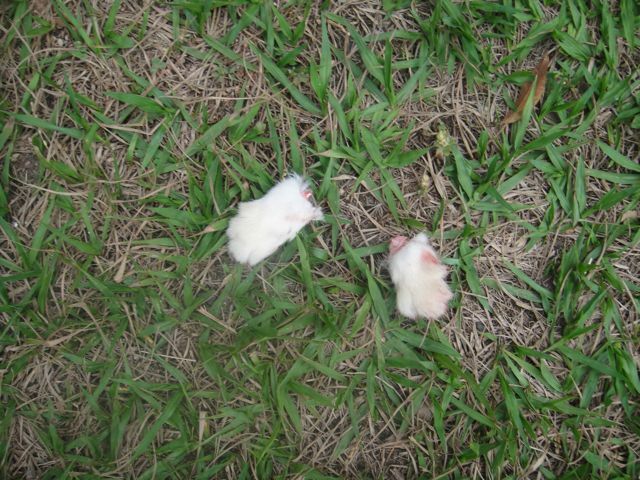 We did trade one of them to a friend for a ready-to-eat bunny, because he was looking for a female. Anyway, the mom and babies were put in a former dog kennel out back, with lots of room to run around. 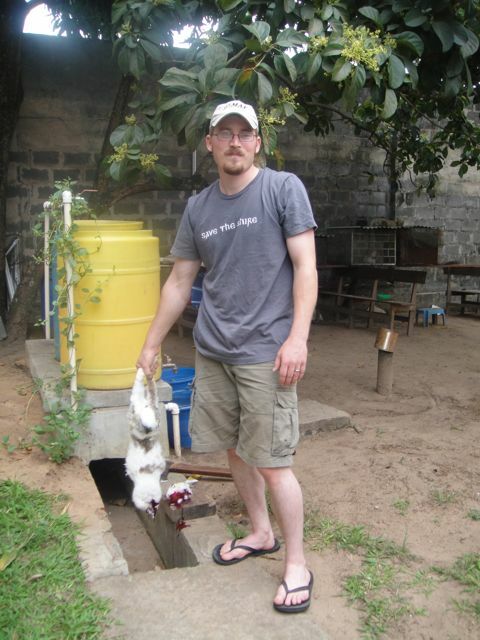 And we’re trying to breed our second batch, but the way we (Matthew) wants it done and the Congolese way are quite different, so we’re trying to work with Mosengo, who does most of the bunny care, but we’d like more baby bunnies. I saw some for sale at Shoprite lately. 15000FC (about $15) for a whole bunny. They even still have their eyes (but no skin or insides). Right next to the ground beef and pork chops. Wednesday we got two new pets. Guineas are native to Congo and are awesome birds. First of all, they primarily, if not exclusively, eat bugs. And thus their purpose is fulfilled in our yard, which is teaming with delicious bugs. 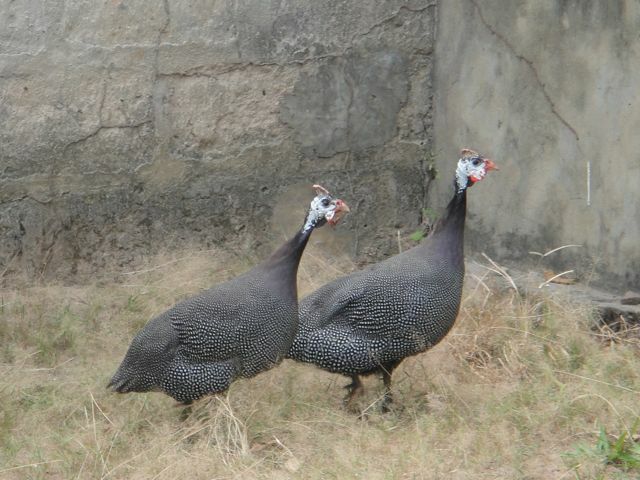 They are also great watch-guineas. They make noises whenever someone or something enters their territory. Of course, they do make a lot of noise. They started at 4:30 the first morning. But, once you get used to it, it’s more like background squawks. This yard already has a lot of bird-noise, so a little more is hardly noticeable. The greatest benefit to a pet you don’t have to feed or clean up after? If you don’t like it, guineas taste great! I’ve been told they taste like pheasant or some other red-meat birds. We’ve had quail and grouse (both from our own property in Alaska), so I imagine that if we get annoyed by the happy conversations between our birds, that we’ll just enjoy their company for dinner. Since they act like such an adorable old couple, we’ve named them Walt and Irma. 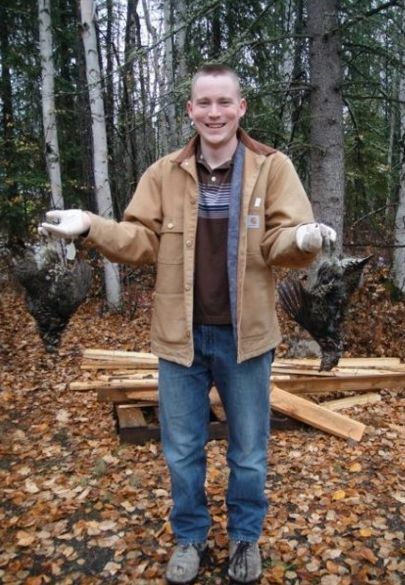 Circa 2010 in Alaska, two grouse wandered down our driveway. We ate them. Thursday the family farm was readjusted to help everyone adjust. The bunnies on cement in the dog kennel were not working out. They had chiggers. Remember the picture of the boy’s toes with chiggers? That was not as gross as watching Mosengo extract the fully-grown chigger-grubs from the bunny toes. EEEWWWWWW. Matthew nearly puked. They went back into their cages with wire bottoms. We hope to have something else put together for them soon, as we get more baby bunnies, especially. Meanwhile, despite all of the literature, the guineas do like one plant in our garden, a locally grown food, metembula. They trampled it a bit overnight and ate bites out of the leaves. So, we must put up a little garden deterrent for them. But, we also should train them to sleep in the same place every night. 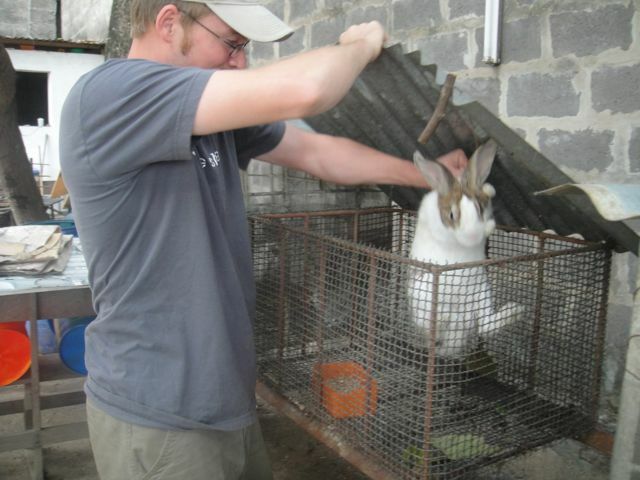 So, after a bit of amusement that I sadly missed, the bunnies are in cages and the guineas are in the dog kennel. They do not look amused either. Friday morning as I opened Amelia’s curtain (which overlooks the guinea-containing dog kennel), I saw an egg! Go Irma! We are hoping to grow more guineas. But, sadly, it was cracked and would not likely grow a new guinea, so I ate it. Actually, I offered it to Matthew and he cooked it for Saturday morning breakfast for me. The egg-to-yolk ratio is half and half, instead of the one to three in chicken eggs, making for a yummy, rich flavor. I did not take a picture of the egg, shelled or cooked. It looks like a brown chicken egg. It was a fantastic treat, but all intact eggs will be saved to be hatched. By a chicken, because guineas are known for being terrible mothers. Saturday was decided to eat one of the bunnies. Actually, the first male we purchased. He is obviously old and probably best eaten. Papa Mosengo, as wonderful as he is, cannot kill an animal. He might be a rare Congolese in this way. So, it was up to Matthew to prepare it. Mosengo even left the gate, something he rarely does, to avoid the screaming. (Yes, bunnies scream while dying, and it’s actually quite horrible.) I couldn’t watch, but Matthew, who didn’t like doing it either, was very brave and got the job done. 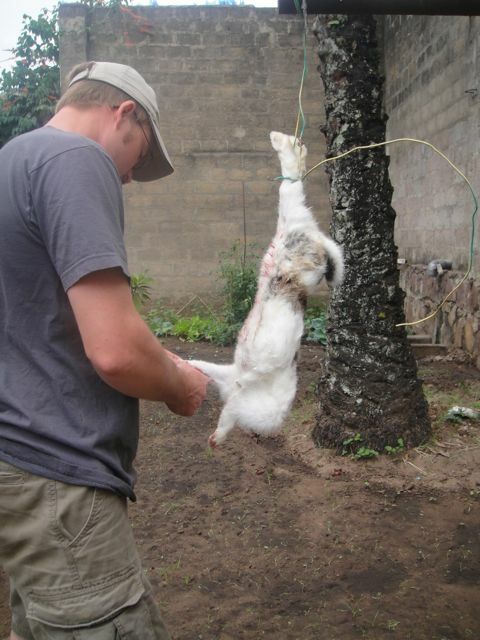 After beheading (which is after the death), he skinned and gutted Papa Bunny, as I called him. He brought him inside, washed him, and split him up to let Mosengo take some home in the morning for his family. 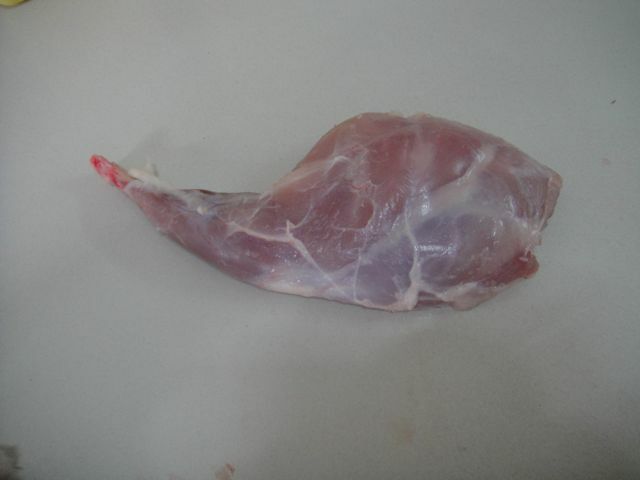 Leg – looks like chicken! 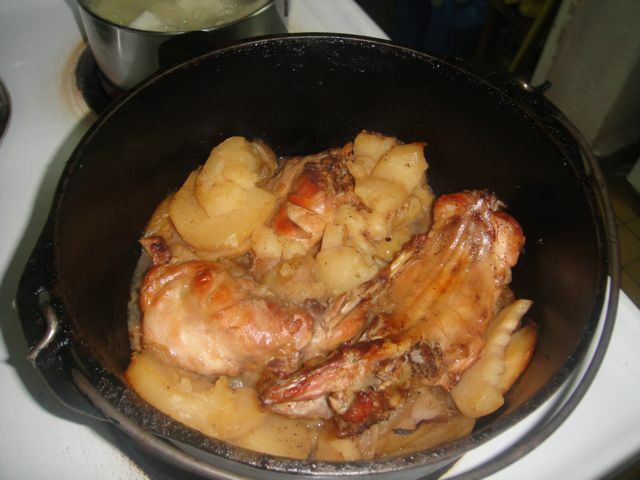 Braised, then roasted in cast iron with onions, apples, and sweet potatoes. So what does bunny taste like? It tastes good. It has the texture of chicken, but more mammalian in flavor. It’s not the best in the world, but it’s good. Great story. Your life is full of the extraordinary, though maybe it will become ordinary to you. Hmm, actually, we believe that raising our own meat, and preparing it this way, is a great alternative to vegetarianism. If we kill our animals to eat them, we have ultimate respect for their life and their meat. We do not take it lightly and we can enjoy the meat even more! I might say that if someone detests the thought of an animal dying, yet freely eats meat, then that could be unhealthy, but seeing and experiencing the entire process is an awesome way to experience God’s gift! Not looking at this one!! !